What are Lucy Glo Apples? Apples never cease to amaze me. There is really no other fruit that I experience in more different colors, textures, and flavors. And there is always a new apple to try. Some might say the market is becoming overloaded with too many differently named apples. I say, bring them all on it. I never get tired of new apples as anyone who reads this blog can see. 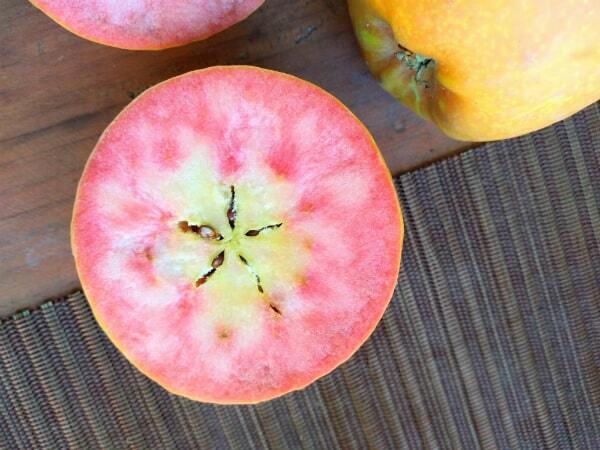 Recently I wrote about the Lucy Rose apple – that’s read on the inside and outside. Today I talking about it’s cousin, the Lucy Glo. And it’s just as amazing! Lucy Rose is red inside and out. Lucy Glo is yellow on the outside and red on the inside. 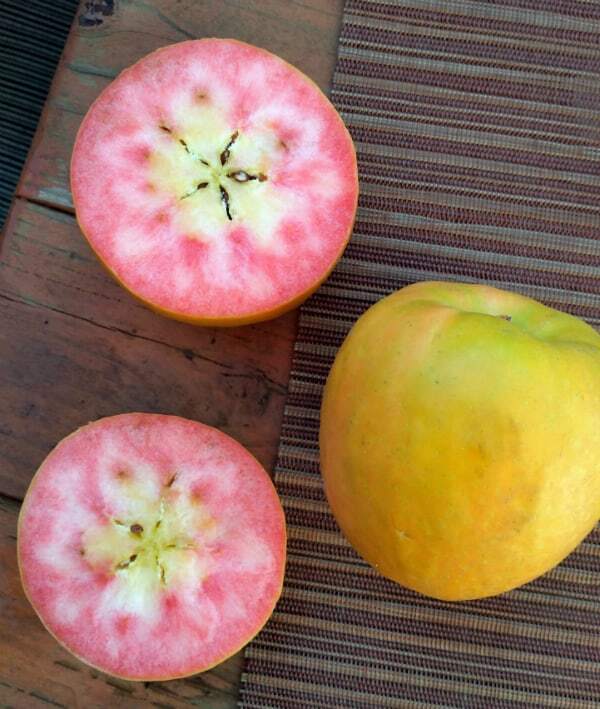 While all of the red fleshed apples I have had in the past have been heirloom varieties, Lucy Glo along with Lucy Rose are a new variety. They are a propriety variety Chelan Fresh. Here is what they say about Lucy Glo. Lucy™ Apples are grown in the heart of Central Washington by a small group of pioneering growers who are passionate about developing new varieties. Through countless years of research and development, they discovered they could grow a great tasting, pink-red interior apple. Lucy™Apples are part Honeycrisp, which give them their sweet, tangy flavor and crunchy texture we all love. Lucy™Glo has a gorgeous yellow skin that allows the red interior glow from within and is tangy with a hint of sweet. If I didn’t have your attention with the red colored flesh, I certainly have it now that we have said the words Honeycrisp. That apple has changed the apple industry and made people a lot of money. Everyone is always looking for the “next Honeycrisp” or as produce workers call it “Moneycrisp”. So it’s not surprise to see people turn to Honeycrisp DNA when breeding new apple varieties. What Do Lucy Glo Apples Taste Like? 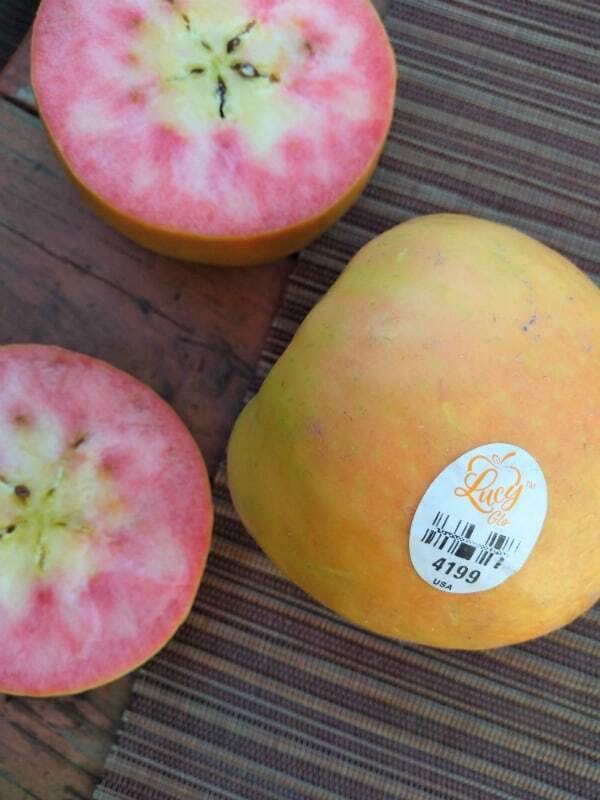 The Lucy Glo apple is a more tart apple than the Lucy Rose, but not too tart all. I took a few bites and got a melon like sweetness that certainly was different. Not bad but different. If you are use to only eating yellow skinned apples like Golden Delicious, this apple will be a new experience for you. They are more tart and crisp than a Golden. Not a really juicy apple though which I have experienced with other red fleshed apples. Sometimes I think an apple can be juicy but completely bland so being juicy isn’t everything. In this picture you can see an apple with a yellow skin with red and green undertones in it. It’s that inside that really pops. Can You Bake with Lucy Glo Apples? Yes you can bake with Lucy Glo apples. They have the right amount of tartness for a baking apple. The color of course will turn heads. You can still see that color if you use them in a pie. 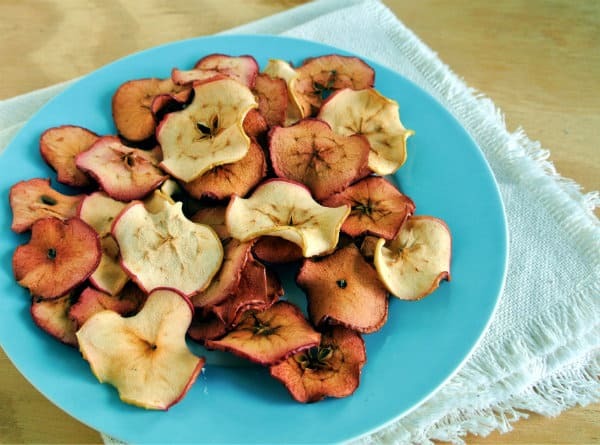 What you really might want to consider trying it making dried apple chips with them I did that before with an old heirloom variety that was red on the inside. I also dried an apple with a really white flesh at the same time. This made for a really nice contrast as you can see in the photo below. Where to Buy Lucy Glo Apples? This Christmas we went to California. I used the Chelean Fresh locator to see where I might find the Lucy Glo apple that I had seen on Instagram. This was the first time I actually found a fruit company with a locator that actually was specific enough to track down what I was looking for. I am hoping Chelean Fresh continues to develop it and adds to it. Also check the comments below to see where others are finding them. These are crazy looking apples. Thanks for sharing. Awesome! I am glad you were able to track them down. Didn’t know they had them at Food 4 Less. Thanks for sharing.